The HD-9, 9,000-lb. capacity, space saver is the ideal vehicle storage for residential garages or commercial buildings. Doubling as a service car lift for smaller service shops who want to do big business. No special foundation is required and the installation is a cinch. Roll the lift outside or make it portable wherever you need it using the optional casters for wherever best suits your needs. The size of an average parking space it will maximize your floor area. Storing ATVs, snowmobiles, jet skis, golf carts, boats or just about anything else that needs to be off the ground just got easier. Make use of that wasted vertical space above your car. If you’ve got at least standard 8-foot ceiling, this 4 post lift will work for you. Dependable design made with 4 heavy-duty, high-quality, stainless steel lifting cables and a single hydraulic cylinder mounted underneath the runway. 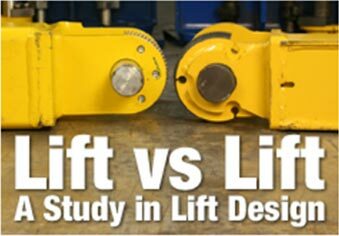 The most durable, maintenance-free lifting system. Dual-hub cable sheaves reduces stress and fatigue on the axles, sheaves and cables. Multi-level locking positions on the HD-9 for variable-height parking. A handy push-button pneumatic safety lock control that releases all four independent safety locks simultaneously. Heavy-duty aircraft cable on each vehicle lift: 4 high-quality stainless steel lifting cables, rated at 14,400 lbs. each. 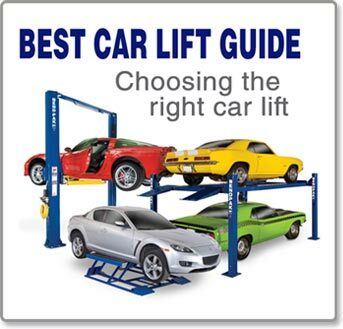 A combined rating of 640% of the maximum lifting capacity of the entire car lift! All lifting cables are securely and safely fully enclosed within the lift structure itself. Electric / hydraulic power system that we incorporated are maintenance-free electric hydraulic power systems for ultimate dependability. Large base plates: the HD-9 has 10" x 12" base plates to provide a solid foundation. pilot fitted, machined steel piston, single-piece, wrapped with specially designed, pressure loaded U-cup piston seals, backups and wear bands to virtually eliminate fluid bypass. A micro-smooth chrome-rod machined from high-yield, micro-alloy steel (ground and polished C-1045/50) and plated to a minimum of .001" diametrically, ensures superior cylinder operation and long life. 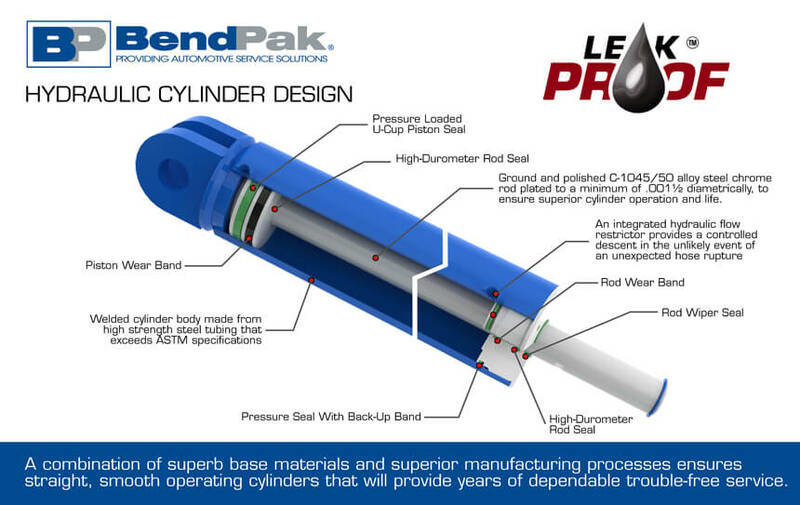 The superior-design high durometer, mechanically-loaded rod seals make rod leakage obsolete. Specially formulated abrasion-resistant urethane rod wiper provides exclusion protection. A welded cylinder body, that exceeds ASTM standards, was made from robust steel tubing. Superb base material and superior processing ensures that the cylinders remain straight, smooth and last a very long time. What more could you want! Providing a controlled descent in the case of an unexpected hose rupture with an integrated flow restrictor . Durable powder-coat finish that gives the metal a high-quality, extremely tough finish which can withstand even the harshest environmental or chemical conditions. BendPak takes pride in their meticulous 10-step process. All parts are visually inspected before being sandblasted. Afterwards, the parts are washed in our 5-stage phosphate tanks. Once cleaned, they're immediately dried to avoid rust production, and then pre-baked parts in a curing oven, reducing the possibility of blemishes that may be hiding in the pores of the metal. If not properly "outgassed", imperfections in the metal may bubble during the curing process and most likely will cause chips in the powder. After the parts are washed and outgassed, any surfaces and / or threaded holes that need to be masked or plugged, are done so with high-temperature masking tape and silicone plugs. Next, the parts are given a quick thinner wipe to remove any light debris or fingerprints, before being hung on an electrostatically grounded conveyor line. The powder is finally applied using an electrostatic spray gun. The powder "sticks" to the surface in a fashion similar to how dust sticks to a television screen. Once the parts are powder coated, the carts are rolled into our curing oven and baked at 400°F for 45 minutes. Four models to choose from: HD-9 Series offers 4 models. The HD-9ST is the narrow model, the HD-9STX is the tall and narrow model and the HD-9XW is the standard-width, tall model. Check them out, click here. Integrated design means lifting cables, airlines, safety latches and sheaves are all fully enclosed. Longer approach ramps were designed to help when loading low ground clearance vehicles. Automatic safety locks made of aircraft-quality stainless steel and aluminum pneumatic cylinders release all 4 locks simultaneously with the simple push of a button. For added safety, a secondary lock system acts as a slack-cable device to engage in the unlikely event of cable failure. The spring-loaded safety locks automatically engage continuously as the car lift is raised. Runway min height: 4 1/2"
Max lifting height: 74 1/2"
Width between posts: 106 3/4"
Width between runways: 37 1/2" - 44 3/8"